Have you ever heard of Arsene Haussaye? He was a French novelist, poet and man of letters born in the late 1800’s. I don’t know Arsene very well yet, but, since I am a lady of letters myself and fond of literature, as well as the 19th century and things romantic, this French writer is someone I should get to know. Why, in time he might even become one of my very delightful “dead friends”. Well, it’s not as though I can get away with doing only those things which I find pleasant as Arsene does. Some uninvited dreary tasks do slip into my days, but I conscientiously work at making time for pleasure, and writing you here is one of those pleasurable activities. Arsene and I both love to write letters. Maybe you do too. You must at least enjoy the subject of letters (receiving them or reading historical letters of famous people) or you wouldn’t be here with me right now. 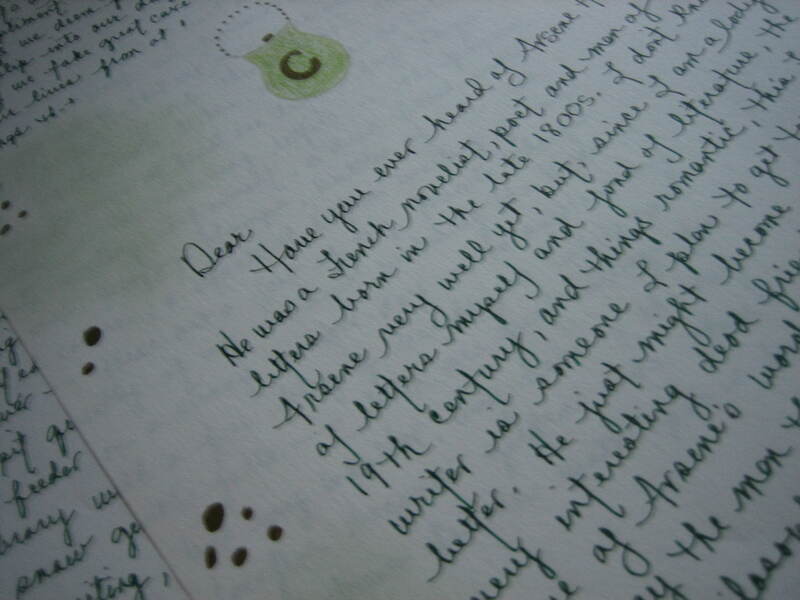 Writing letters, receiving letters … the papers, a favorite writing instrument, a desk filled with sealing wax, postage stamps, bottles of ink in assorted colors, a stack of letters waiting for an answer — these are a few of my favorite things. Oscar Hammerstein II said, “We simply remember our favorite things and then we don’t feel so bad”, but going one step farther and doing, embracing and experiencing our favorite things makes us feel even better. What are some of your favorite things? Are you seeing that those things make it into your daily life? Because I’m a letter writer I can enjoy my friends every day without getting worn out coming and going. I might write letters in a coffee shop (for I love coffee and I love coffee shops) but my favorite letter writing time happens in early morning at my home. The house and everyone in it is still asleep and quiet. 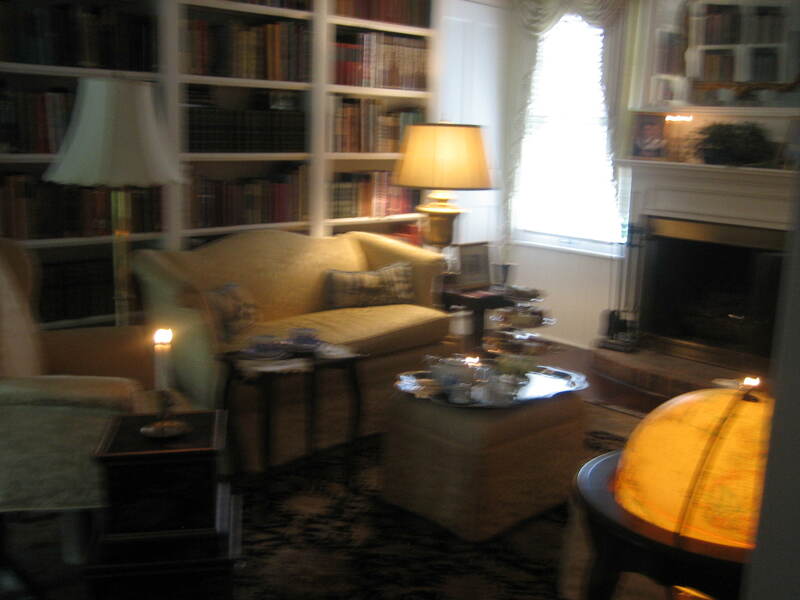 I make my coffee, and in cold weather stumble into my library. Maybe I’ll light a fire in the fireplace. In warm weather I have a different favorite letter writing location. I come out to the porch. Here I sit quietly in solitude. I gaze out my windows at the trees, the birds, and the sky. 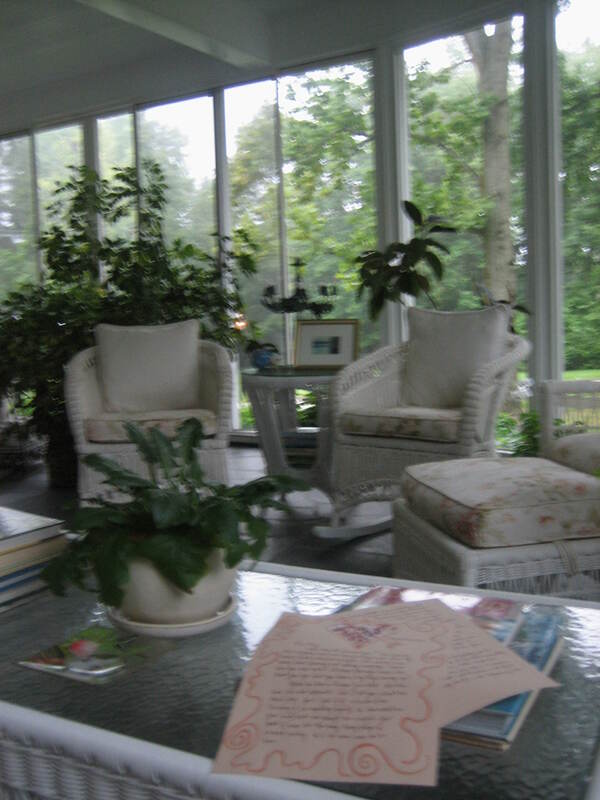 I enjoy this alone time reflecting, and then I share some of my reflections with a letter friend. I find this ritual to be sheer bliss and a great way to start the day. But any location and any hour of the day becomes golden when we’re enjoying our favorite things. 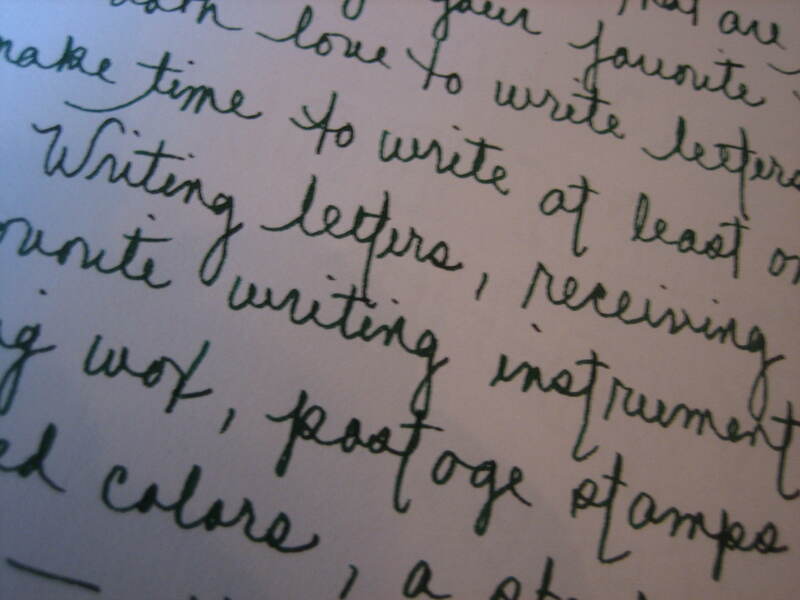 Though letter writing is not my only favorite thing – there’s music, cooking, gardening, knitting, hosting teas, ectaetera, etcaeterorum … the extra special aspect of letter writing is the ease of it. It’s relaxing. I can put my feet up and write while lounging in my pink pajamas and comfy slippers. Letter writing isn’t only a mix of solitude and society. It’s also a mix of physical relaxation and intellectual stimulation. Then there’s the ‘Magic of creation’ to consider. Even if we’re not as brilliant or popular as some artists might be, we truly become artists whenever we’re involved in creation. It doesn’t matter what our creation is – a poem, a song, a chocolate chiffon pie, a letter – all creation is very satisfying. As we create we team up with The Supreme Creator. We make something out of nothing. And when we share our creations we then experience even greater satisfaction. I consider myself to be a spiritual person. I think we’re put on this earth to try to know God, to teem up with Him accomplishing good, to be of service to others and to do our work with joy. And we can be of great service to others simply by connecting with them, by sharing with them. No man should be an island. But besides being spiritual, there is a real material girl inside of me too, she’s the one that loves the materials used in letter writing. I wonder if you feel the same attraction to these materials. Perhaps you do. 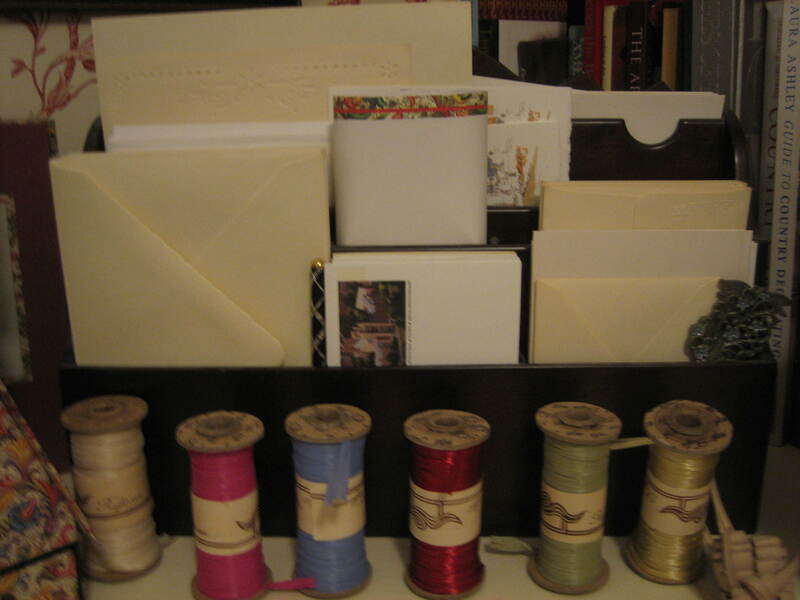 Perhaps you love paper stores and have cabinets full of paper and pens as I do. 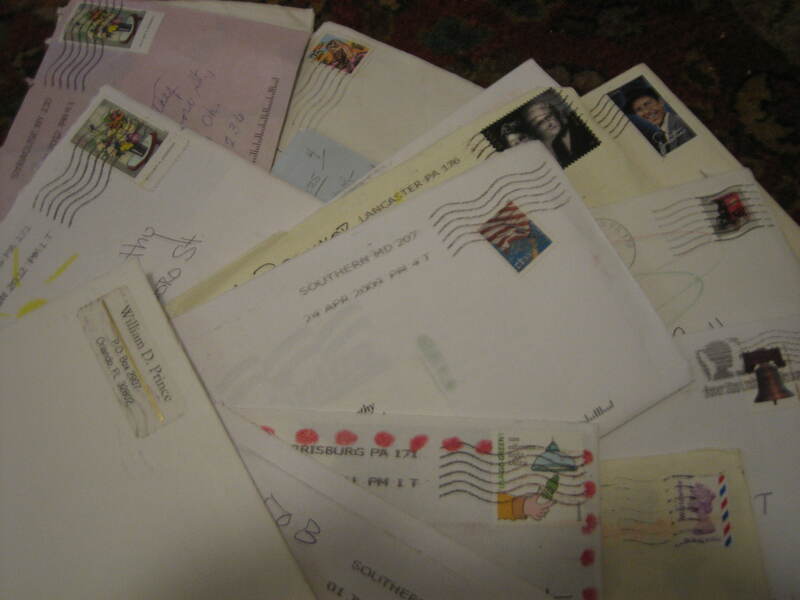 I do try to keep up with all my letter friends, but like a missionary, I also feel the need to spread the word about letters, and I’m so delighted when I see people from places like India, Japan, Norway, France, Canada, The United Kingdom and other far off countries sharing thoughts and words on this subject of letters with me. I hope you’re all having as grand a time as I am writing and receiving letters and I’m hoping to hear from you, yes, write me a letter too!